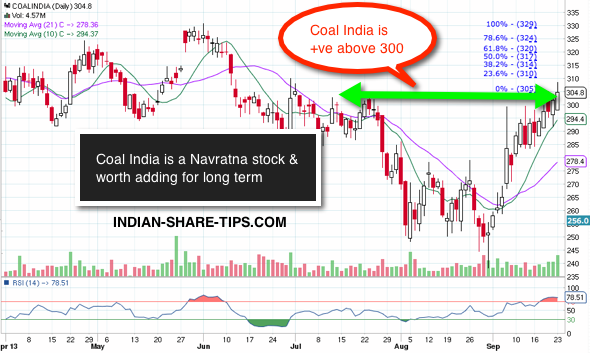 Is CoalIndia a Buy Now? CoalIndia is a Navratna stock and is now appearing to be waking up from its slumber. The stock has moved above the level of 300 with nice volume and stock remains a buy above 300 level and can be added from medium to long term perspective. Have a look at below chart which shows that stock has marched upwards provided govt once again do not come with some clumsy policy which may spoil the party. The likely levels to which stock can target have been indicated in the screenshot. Please note that stock becomes a sell below 300 level. You can check other free stock tips here and can consider us for short term stock tips or for best intraday tips here.